On the other hand, driving in Vietnam is sometimes the most frustrating thing about living here. There seems to be a lack of rules, or a lack of enforcement of rules. When asking a Vietnamese person what the rules of driving are, they look at me like I just spoke Dothraki to them. After living in Vietnam for 2 years and driving everyday, I believe I have a pretty good understanding of how to drive in Vietnam. People don’t like to stop in Vietnam. They’ll do anything they can to have to avoid stopping. This means driving on the wrong side of the road, running red lights, and making danger-filled decisions. When you first start out, you’ll likely want to stay close to the curb and drive at a reasonably slow pace. This is fine. You can go as slow as you want, but just be aware that people will be coming down the road, driving in the wrong direction, and heading right for you. You’ll want to leave some space between yourself and the curb. Motorcycles always stay to the right, and cars to the left. If you’re on a highway, there will be a designated lane for bikes (as seen in the photo above). 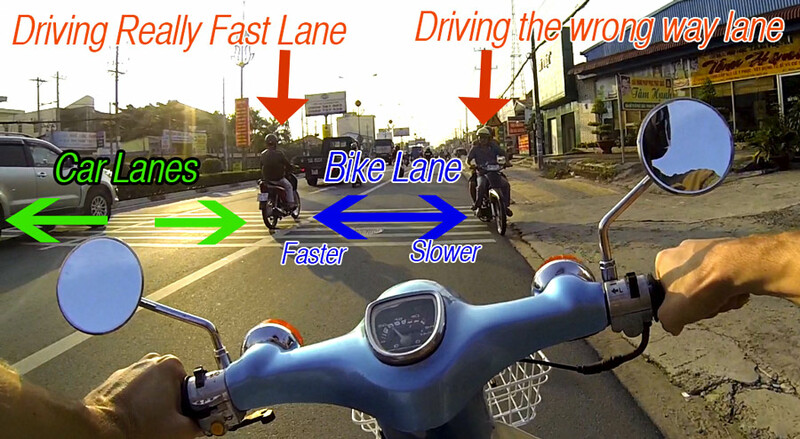 As you get more comfortable on the motorcycle, you’ll use the car lane to get around people a bit more. This is actually illegal, but very common, and relatively safe if you are checking to make sure no cars are coming. Why are so many people driving on the wrong side of the road? If someone is turning left onto a busy road, instead of waiting for an opening in traffic, they’ll often drive along the curb on the wrong side of the road until there’s space to get into the proper lane. If someone is trying to turn left, instead of stopping at the intersection and waiting for an opening, they’ll often cross over to the other side of the road as they approach the intersection, and then take the left turn on the opposite side of the road. This helps to keep the traffic flowing, but it’s also a bit dangerous. However, I think it’s less dangerous than stopping in the middle of the road while you wait to make a left-hand turn. Because there isn’t much stopping while driving a motorbike in Vietnam, no one expects a bike to be fully stopped in the center of the road. You’re a sitting duck. The image below better illustrates this. The photo above shows 4 different ways to turn left. Many Vietnamese will choose to cross the lane of traffic early and drive on the wrong-side of the road for a bit before making the turn. I sometimes use this technique. It depends on how much traffic is coming when I approach my turn. I always try and make the turn without having to stop – not because I’m impatient, because I feel it’s safer. I learned early-on that this style of turn doesn’t work in Vietnam. In the western world, it works because there are stop signs and… I guess patience? But truthfully, there is no need to use this type of turn unless you are in a car. Bikes take up less room and are more mobile, so you’re better off going with any other turn listed here. This is my turn of choice. I like to get to the center of the road and then gradually take the turn – at an angle – entering the next road also in the middle. This allows me to dodge traffic on both the right and left. It also lets me easily abandon the turn if I need to. I only ever use this technique if my turn comes up before I’m ready. Simply put, it’s stopping at the side of the road and waiting for an opening in traffic, then crossing to the other street. As a beginner, perhaps you’ll feel like this is the safest option, but in a heavy traffic you might find yourself waiting for an opening for a while, and eventually take even more of a risk than you would have. In Vietnam you’re responsible for what’s in front of you, so if you do get rear-ended it’s probably not your fault. You’re expected to be able to stop in time for whatever happens to be in the road. Because of this rule, most people don’t check their mirrors or blind spots when making moves on the road. It’s very common to see someone pull out of a street, turning right, and not looking to their left at all. I always check my mirrors, and I recommend you do the same. On a few occasions, I feel as though a shoulder check has helped me avoid an accident. I also always use my indicators when making a turn. Of course. Why wouldn’t you? Well, in Vietnam a turning signal is only accurate about 50% of the time. Usually, they’re not used at all, but never make a decision based on an assumption that someone is turning in the direction that their signal is indicating. Amongst all this organized chaos is the larger vehicles that usually get in the way. Buses, trucks, and taxis are the most dangerous. Drivers of privately-owned cars are not as reckless, but they can be just as much of a nuisance. I think because the taxes on a car are so high, people are very careful not to damage them. Drivers will take turns painfully slow. Motorbikes will zip around them until there’s no more space. If you stop to let the car make its turn, you’ll only find yourself sitting there as the vehicle inches itself in its intended direction. It’s quite annoying. Sometimes I want to yell at the car driver to “Just go!” but it’s probably better than having cars making erratic turns everywhere. Roundabouts in Vietnam are a bit of a mystery. There doesn’t seem to be any rules about who gets the right of way. If you’re a beginner, I recommend waiting for another driver, or even better – a group of drivers, and using them as protection. Generally, you go when you can, and you stop when it’s dangerous. Sometimes this means stopping before you enter, sometimes it means stopping while in the roundabout. Never trust that someone won’t drive right through a red light. It’s common for people to run red lights when they just missed the green one, so don’t charge through intersections as soon as the light goes green. Other people just don’t want to wait, or slow down, or make it home alive, so they’ll just plow through the light like it isn’t there. Its people like this that make driving in Vietnam so dangerous. If you’re at a three-way intersection, and on a motorbike, you can drive through a red light if you’re going straight and there is no road to your right. It’s also common for people to turn left on a red light at a three-way intersection. I don’t know if this is always legal, but I see it almost daily on roads of all sizes. One of the things I hate most is when someone turns left from the far right lane, cutting across all the traffic that’s going straight. I don’t understand why they think this is safer than getting into the car lane, or even to the left part of the bike lane, but it drives me crazy. If you want to turn left at an intersection with a stoplight, I would recommend going into the car lane and getting as close to the front as possible. When the light is green, you can take the turn on an angle, going immediately, even before the people going straight. In most western countries, people turning left wait until after all the people have cleared out that are going straight, but if you can make it before them, which is usually possible if you cut over on an angle, I think it’s safer than slowly making your way through as traffic whizzes around you. Just be aware of people coming through the light late. Motorbikes, but not cars, can turn right on all red lights. You don’t even have to stop first. Horns are used liberally in Vietnam. That will become obvious after spending 10 minutes in the country. I’m probably guilty of not using my horn enough. Some drivers use it every time they turn. Seriously. It drives my insane. Others will use it when they are approaching someone from behind, as a sort of ‘heads-up’. Generally, I only use my horn to say, “Don’t even think about it, BUD!” — when I don’t want a person to do the dangerous move that they’re thinking about doing, and will ultimately have me on the pavement in blood and tears. When I first started driving in Vietnam, I paid attention to all the little honks, thinking that each one was a warning to me. Now, I mostly ignore them. Young drivers that have no fear (and little experience), and are trying to show off. Bicycles. From behind they can look like motorbikes, but they don’t drive nearly as fast, so they’ll sometimes take you by surprise. Also, it’s common for more than one person to be on a bicycle, which makes it harder to control. Overly loaded motorbikes. Vietnam is known for this, and sometimes it’s pretty entertaining, but it’s also pretty dangerous. Don’t tail someone that is carrying too much. Long death poles. For some reason, there always seems to be someone carrying a giant metal pole. Usually, they just hold it like a spear and drive with one hand. If you’re not paying attention, you might not see the end of the pole and drive right into it. Bad parents. Unfortunately, I see a lot of kids riding around with no helmet. Sometimes, they’re babies being held by their parent as they drive with one hand. Sometimes it’s a toddler standing on the seat in between mom and dad. No matter how it’s organized, you definitely want to take precaution around these bikes. The parents are often distracted drivers, but worse than that – even a minor fender bender with a bike carrying a helmet-less child… I don’t even want to think about it. Truck and bus honks. Of course it’s good to get a warning from a truck if you are in their way, but the horns on some of these vehicles are ear piercing. I’ve been to small venue Slipknot concerts that were quieter than these horns. It’s actually startling and somewhat dangerous. Drunk drivers. It happens way too often in Vietnam. Drinking in Vietnam is a sport. On a Friday night, the roads are bustling with intoxicated dimwits. Be extra careful. I hope I didn’t scare you off too much. Driving a motorbike in Vietnam is one of my favorite things about living here. It gives you a sense of freedom that you don’t get in a car. Motorcycle road trips are popular for backpackers, but many of them are ill-prepared when they set out to drive across the country. Hopefully, these tips will help you safely have an experience of a lifetime. Hi. I have been living in HCMC for over a year now. I ride a bicycle everywhere. My experiences on the roads are as yours have been. I have tried to explain the traffic situation in HCMC but to friends to no success. However, your description of the “road rules” is priceless!!!!! My oddity of all the chaotic traffic situations was the reverse warning jingle on a large tipper truck that I happened across. This was the one stand out event for me! It was playing the tune of the Christmas Carol “Away in a manger”. That’s hilarious. A traumatic moment with a lullaby as the soundtrack.